Cutting-edge Nutrition for the Ultimate Show Look. Highly Palatable and Power-packed Ingredients to Unleash Full Potential. Plant Protein Products, Spray Dried Whole Egg, Processed Grain By-products, Animal Fat (Preserved with BHA and Citric Acid), Calcium Carbonate, Zinc Methionine, Monocalcium/ Dicalcium Phosphate, Ferrous Sulfate, Copper Sulfate, Ethylenediamine Dihydriodide, Basic Copper Chloride, Manganous Oxide, Sodium Selenite, Zinc Sulfate, Zinc Oxide, Biotin, Vitamin A Supplement, Vitamin D3 Supplement, Menadione Sodium Bisulfite Complex, Calcium Pantothenate, Riboflavin, Niacin, Biotin, Folic Acid, Pyridoxine Hydrochloride, Vitamin E Supplement, Vitamin B12 Supplement, Mineral Oil. ACTIVE DRUG INGREDIENT: Ractopamine Hydrochloride . . . . . . . . . . . . . . . . . . . . . 430 g/ton CAUTION: Ractopamine may increase the number of injured and/or fatigued pigs during marketing. Not for use in breeding swine. WARNING: The active ingredient in Paylean, Ractopamine Hydrochloride, is a beta adrenergic agonist. Individuals with cardiovascular disease should exercise special caution to avoid exposure. Not for use in humans. Keep out of the reach of children. The Paylean formulation (Type A medicated article) poses a low dust potential under usual conditions of handling and mixing. When mixing and handling Paylean, use protective clothing, impervious gloves, protective eye wear, and NIOSH-approved dust mask. Operators should wash thoroughly with soap and water after handling. If accidental eye contact occurs, immediately rinse eyes thoroughly with water. If irritation persists, seek medical attention. The material safety data sheet contains more detailed occupational safety information. To report adverse effects, access medical information, or obtain additional product information, call 1-800-428-4441. Feed continuously as the sole ration to finishing swine weighing not less than 150 lbs for the last 45 to 90 lbs (group average) of weight gain prior going to market. 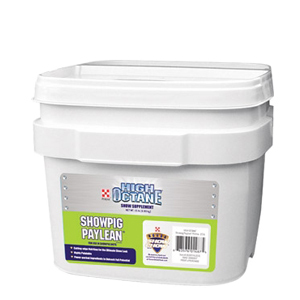 The enclosed HIGH OCTANE® cup can be used to measure HIGH OCTANE® Showpig Paylean® Premix (2 oz. measuring line). To produce a feed medicated with 9g/ton Paylean®, add 2 ounces per day to 5.875 lbs of Honor® Show Chow® Showpig Grower T100 or Honor® Show Chow® Finisher T100 and mix thoroughly.